Most of the runners who found the right fit found the Speedtrak to be very comfortable. It is a worthy investment, according to a handful. The shoe is extremely durable, based on the observations of more than a few. Very aggressive and multi-directional lugs provide grip on rugged surfaces. Several obstacle course racers loved the combination of traction, and durability in the Salomon Speedtrak. Some users mentioned that the upper dries fairly quick and easy to clean. A few noted that the interior of their shoes was very clean after a tough run on dirty off-road trail. The QuickLace system offers effortless cinching that does not untie or loosen. Several runners appreciated the QuickLace system for its ease of use and utility. Most of the negative reviews were about how narrow the toe box is. A handful of obstacle course enthusiasts remarked that it is a bit heavy. Some runners felt that the ride was a bit jarring on hard ground due to the aggressive and very substantial lugs. A small number of obstacle course participants wanted drainage holes in the shoe as it is one of Salomon’s biggest market for this shoe. It runs small, according to several expert reviewers. Salomon offers the Speedtrak as an update to the Fellraiser. It does, however, bring many of the features that have made the Fellraiser quite a popular choice among runners and obstacle course racers. The Speedtrak has unbelievable traction, excellent durability, and a no-brainer of a choice for muddy or wet running on rugged and difficult outdoor surfaces. The Salomon Speedtraks is a highly capable, rugged trail shoe. Best for mud, grit, dirt, sand, etc. Comfortable on the trail for long distances. Not good for ice, wet smooth surfaces, and not comfortable for long road distances, at least for me. I first got turned on to Salomon trail shoes in 2017, at the Whiteface, NY Sky Race. It was my first one, and I showed up in my (until then) adequate Asics trail shoes. That day consisted of 7500 of elevation gain and corresponding decline over about 16 miles. It was hard to escape noticing on the start line that most of the real-deal contenders were sporting Salomons with intense, thick lug patterns; some with half gaiters around the ankle. I started to suspect that I had brought a knife to a gun fight, and unfortunately, I was right. Within 5 miles, and a climb up and run down Whiteface later, my shoes were literally shredded, and my toes were poking out. Despite spending several minutes trying to repair them with duct tape, they only got worse throughout the day. In the end, the toes had both worn out completely, and I was wearing sandals for all practical purposes. Everyone's Salomons looked just fine, albeit very muddy. At that point, I knew it was time to make the jump to real-deal trail shoes. I went home, did some research and settled on the Speedtrak. For one, the price was good. Second, it had a noticeable but reasonable drop at 6mm. I don't go for zero-drop, but at the same time, I don't like the more aggressive 10-12mm models for longer distances. The 6mm seemed like a sweet spot, and has worked well for me ever since. Moderate drop (as mentioned). This totally works for me for trail. Kind of a Goldilocks, not too high not too low. The pull-strap lacing system. Having narrow feet, I was skeptical this would be as good as laces, but they have worked quite well, and once locked they do not come undone. The only bad thing that can happen is when you stuff the end of the strap in, but it works itself out the slack kind of flaps around. This happens occasionally but is not as bad as having laces come undone, as the tension still stays in the system and you can finish a race if you avoid stepping / snagging it. The heavy lugs. The lugs on this shoe are enormous. They are great for mud, funky turf, sandy, gritty, gravelly trails and the like. I've worn then through several Spartan (muddy obstacle course) races, and they excelled in the mud. Where they don't do well is slick, smoother surfaces. Ice, wet wood, and wet rocks are not your friend with these. I suspect the rubber compound is the main issue, so maybe future generations of the shoe could address this. The upper is smooth and comfortable. I've never experienced any blistering or discomfort from them aside from what can normally be expected with running long distances in wet conditions. In my older pair, there was some tearing early on, but I liked them and used the shoes too much to exchange them, and it hasn't gotten much worse. The toe material feels quite durable, and I've never stubbed my toe on anything. The sole is quite thick. This is great when you're stepping on rocks or other pokey material. It doesn't make for the most sensitive feel, but I don't think you can't have your feet protected and feel the rocks intimately at the same time. I have noticed that during road portions, they hit pretty hard. Probably due to the thick plastic sole and modest padding. Overall I have thoroughly enjoyed these shoes, and I'm working through my second pair. I've also been able to test run a few other Salomon models and found them to all be very comfortable and at home on trail runs. The price points are not bad, especially if you catch them on sale. Since purchasing them I've done mostly half-marathon distance trail runs and races, and they have performed admirably every time. I've even garnered a few top-10 finishes in local races (woohoo), although this may have more to do with the narrow demographic of people willing to do 13+ miles of trails than the Salomons. The Fellraiser with the same fit, better materials, and a new name. 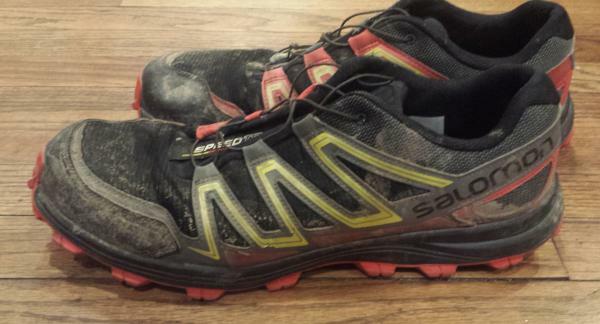 The Salomon Speedtrack is a beast on trails. I would wear it for any trail run or ultra-marathon. You do lose being “light on your feet”, but this is probably about as light as you can get with this much durability. Salomon made most of the modifications in the Speedtrak vis-a-vis the Fellraiser in the upper. A new anti-debris mesh is more breathable, but also does a better job in keeping debris off the running shoe. The upper has a more durable upper for tough outings off the road. It has very substantial overlays and a thick toe bumper for the best protection against the rough outdoors. The rubber compound has been improved for better traction in wet conditions. This works together with the massive lugs for superior grip on mud, grass, and loose terrain. The fit of the Salomon Speedtrak is a bit narrow in the forefoot. There is a good hold in the midfoot and the heel without any dangers of hot spots or being too constraining. The lacing system and the fairly accommodating upper hug the foot for more support and security. It runs true to size. The outsole of the Salomon Speedtrak is covered with very aggressive and multi-directional lugs from the heel to the forefoot. Some of these lugs are facing opposite each other for better downhill or uphill running. The outsole layout is also designed for challenges in an obstacle course. Salomon uses the placement of the lugs to prevent mud or loose terrain from clinging into the outsole. The proprietary Wet Traction Contagrip covers the underfoot for superior traction on wet surfaces. A very simple injection molded EVA covers the whole midsole for standard cushioning, responsiveness, and durability. Like most full-length designs, the midsole foam helps with the movement from landing to take-off. It makes transitions, a bit more efficient and quicker. Similar to the well known Salomon Sense Ride 2, the most prominent parts of the upper of the Speedtrak are the Sensifit overlays or the huge supports coming from the TPU overlays on both sides of the foot. These overlays extend to the heel to provide an all-expansive hold for stability and support on uneven and difficult terrains. The anti-debris mesh adds support and breathable coverage in this shoe. More protection comes in the form of the rubber toe cap that superbly shields the toes from getting bruised. A gusseted tongue that helps with the prevention of debris from getting in and a lace garage are two additional trail-specific features in the Speedtrak. An anatomically designed EVA footbed adds cushioning and support.